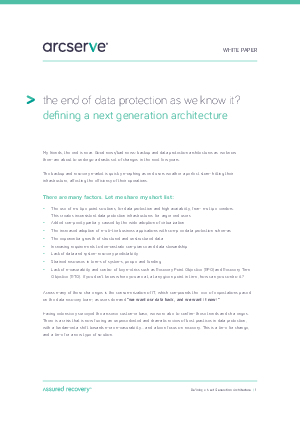 Fueled by data growth and technology advancement, such as virtualization, current architectures come up short in a number of areas and perpetuate data protection islands or silos. A fundamental change is necessary to fix data protection. It requires the adoption of a modern architecture that has been designed to solve today’s complex problems, as well as provide a highly scalable platform for the future. Read this white paper to find out what this architecture must include.